Sweet lemon citrus filling with an almond flavored shortbread cookie crust. Topped with a tart lemon glaze. Everyone loves these Sunburst Lemon Bars and they couldn’t be easier to make! Lemon cookies are delicious but these Sunburst Lemon Bars take “lemon love” to the next level. 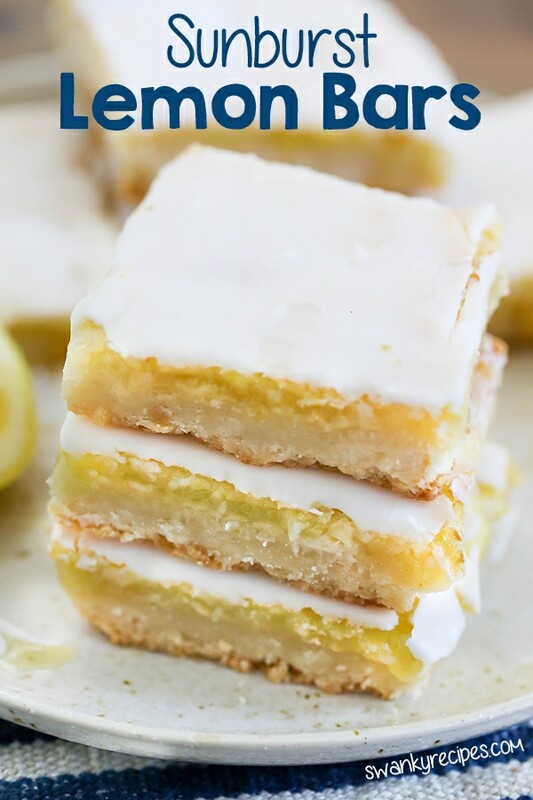 Each bite is like a little slice of heaven baked into an easy almond shortbread cookie crust and an ooey gooey citrus lemon pie center. Lemon one of my favorite flavors to experiential with and when you try this lemon bar, you’ll understand why. These scrumptious citrus lemon pie bars are an early birthday present to myself and I couldn’t be happier to share this sunshine dessert. 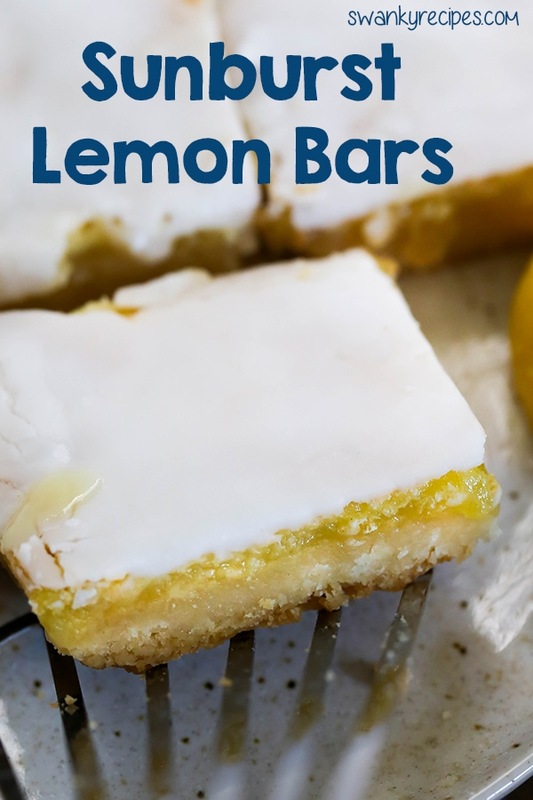 If you’re a lemon fan, this citrus dessert bar recipe is for you. If you love shortbread cookies, then this recipe is for you and finally, if you enjoy simple recipes, this is the one for you! 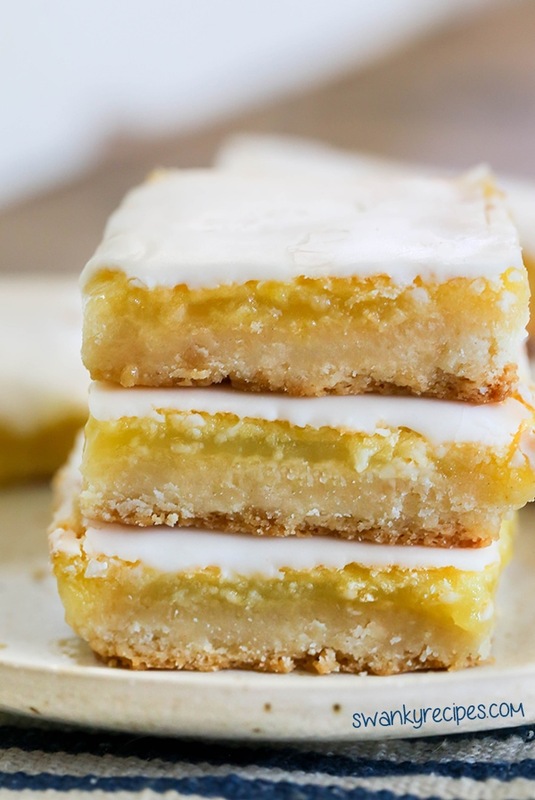 In a matter of minutes, these lemon pie bars come together. 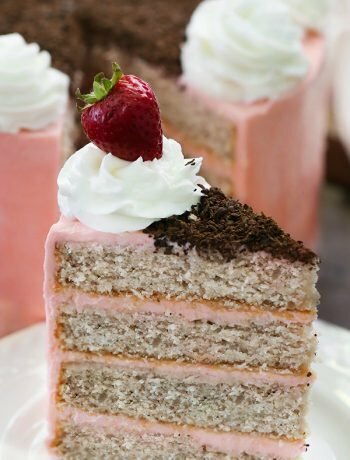 Plus, this recipe uses simple ingredients and the directions make this recipe so easy to prepare. 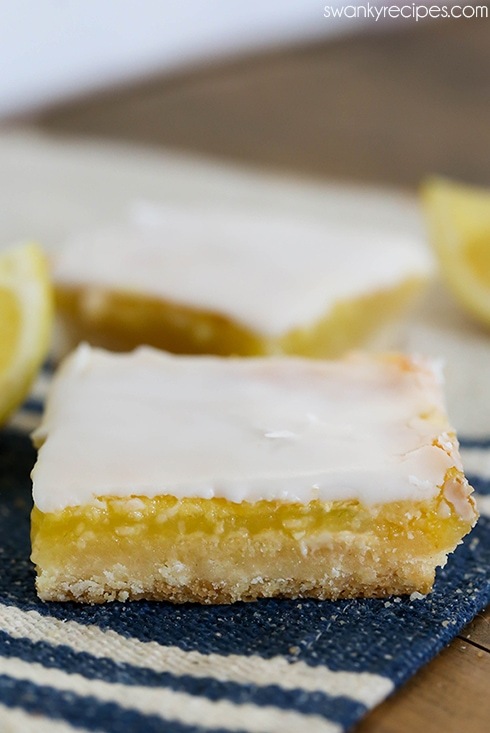 The powdered sugar and lemon icing glaze provide a nice sugar crunch on top of each bar. The moist lemon bar center is soft and full of delicious citrus flavors that combine perfectly with the crunchy lemon glaze topping and almond shortbread cookie crust. I had a box of almond paste in my pantry and I love to add almond flavoring to shortbread desserts. Instead of using almond extract, you can incorporate almond paste into the shortbread dough for an added level of flavor. Almond paste is sold in most grocery stores and it can be found in the baking aisle near canned pie filling or marzipan. 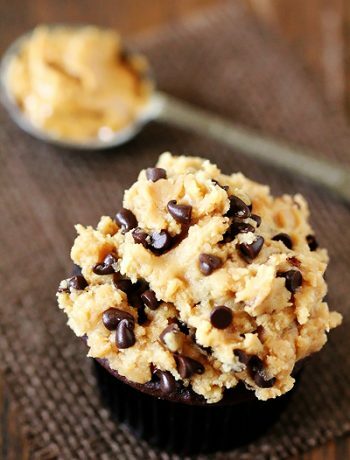 Of course, you can omit almond paste altogether or opt to use a teaspoon of almond extract. Sunburst Lemon Bars are a childhood favorite and an easy dessert to make for any occasion. 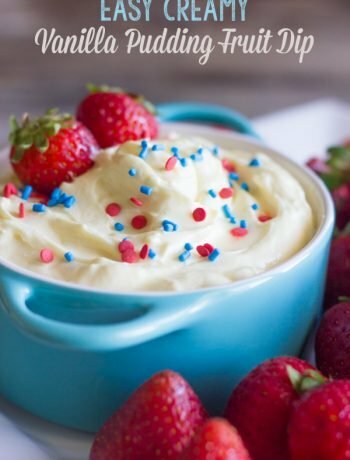 I love to make these for Mother’s Day, Christmas holiday parties, and any time I’m craving a sweet lemon dessert. If you love tender almond shortbread and sweet lemon filling, you’ll want to grab this recipe and make it today! Want more lemon recipes? Everyone raves about these Lemon Sugar Cookies or these Lemon Cream Cheese Cookies. Sweet lemon pie citrus filling with an almond flavored shortbread cookie crust. Topped with a tart lemon glaze. Everyone loves these Sunburst Lemon Bars and they couldn't be easier to make! Heat oven to 350°F. Line a 13x9-inch baking dish with parchment paper. Do not use foil for this recipe. If you don't have parchment paper to easily remove bars from pan after baking then proceed with an ungreased baking pan. In large bowl fit with a mixer, beat base ingredients on low speed until dough comes together. Press mixture evenly in bottom of a 13x9-inch pan. 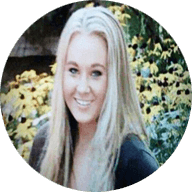 Bake 20 to 30 minutes or until light golden brown. In medium bowl whisk eggs. Beat in filling ingredients; granulated sugar, flour, baking powder, and lemon zest. Beat in 1/4 cup lemon juice. Remove partially baked base from oven. Pour filling evenly over warm base. Return to oven; bake 25 to 30 minutes longer or until top is light golden brown. If top starts to get too brown, cover with foil and continue to bake until center has settled. Cool completely, about 1 hour. 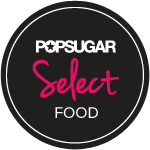 In a small bowl, combine powdered confectioners' sugar and lemon juice or water. Evenly spread glaze over the top of the cooled bar. Refrigerate until center is set then cut into bars.